This is one core component you want to work consistently in your car, truck, SUV or hybrid. Without fail. Because a brake failure is downright scary and dangerous. 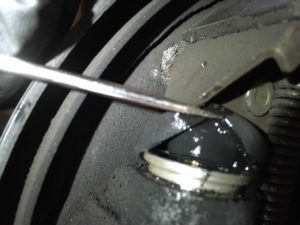 This is a picture of a brake fluid leak from a rear wheel cylinder on a Honda Civic with drum brakes. Brake fluid leaks can cause unsafe braking conditions. If your brake fluid is low be sure to have the systems inspected. During your vehicle’s “bigger” maintenance services, (the 30k, 60k, 90k & 120k mile appointments) the brake fluid usually gets flushed. But in addition, you’ll want to monitor, or check in on, the wear on the brake pads as well. Kind of the same way you’d keep an eye on your tires’ wear & tread levels. If you’re feeling like you have to really stomp down hard on your brake pedal, or that you need to push really far in on your brake pedal to feel your vehicle’s braking system engage, definitely have your brakes looked at sooner than later. We’ll have a technician take a test drive with you if you’re concerned about your brakes. Let’s get you some piece of mind! We want you safe, happy and thriving in your life and on the road! Schedule your next service with us. We’re ready to take good quality care of you & your car, truck, SUV or hybrid.